The Afflicted are a collection of Bretons 'blessed' by Peryite with a wasting disease. For whatever reason the Daedric Prince chose to then isolate them in Bthardamz, where you are sent during the Daedric quest The Only Cure. They have unusually red skin and the ability to vomit poison at close range. 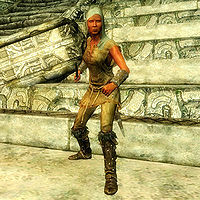 When the quest is completed, various Afflicted Remnants may be found roaming Skyrim and they will attack you on sight. The Afflicted are weak adversaries at most levels, but can overwhelm in groups of casters. Afflicted inside Bthardamz cannot respawn, since the interior of the ruin is set not to respawn. The ones outside, however, can respawn if you leave them long enough while The Only Cure is still active. This page was last modified on 10 February 2019, at 09:58.